Last year this table was full of wild Oregon white, black and even brown truffles, freshly harvested. The sole example of an Oregon Black the leading purveyor Oregon Wild Edibles! had on hand, and even it was starting to rot without fully ripening first. We’re starting to feel more like real Oregonians going to events for a second year in a row. We’ve got a track record, a history, here now. 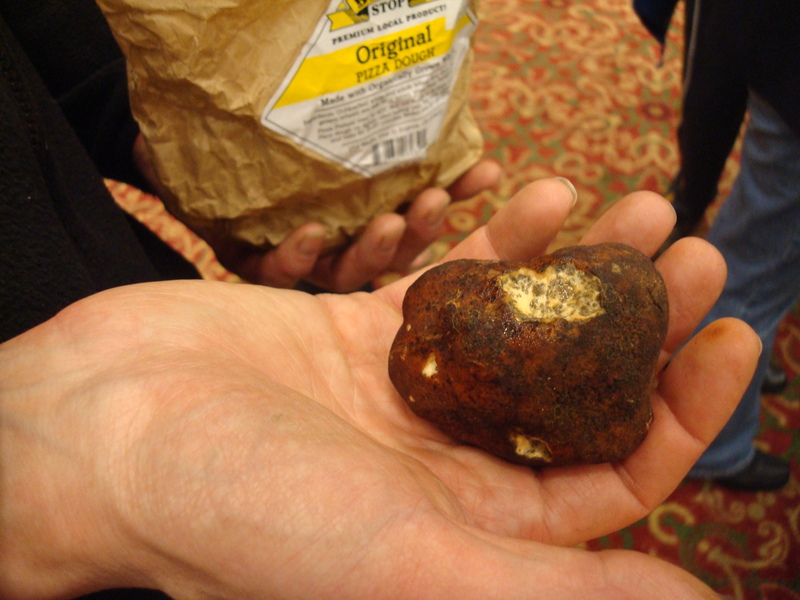 Sunday I attend my second Oregon Truffle Festival in Eugene (not the $1,000 gala weekend affair, just the very worthwhile $15-20 marketplace, with its truffle samples and wine-tastings galore). 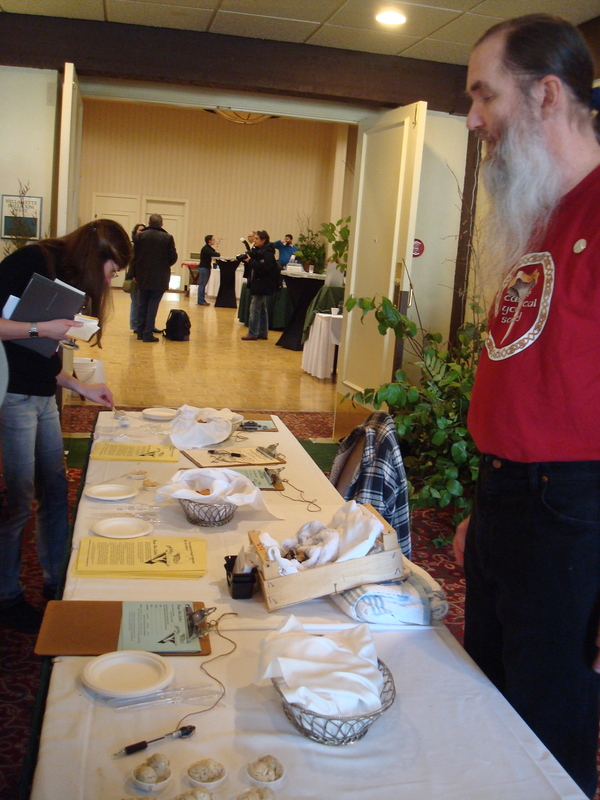 Attending the event with my mycologist neighbors Dan and Joyce last year inspired my recent Oregonian FOODday article and radio show on truffle dogs. That’s where I first met Jean Rand, trainer of Oregon’s most proficient truffle dog–Gusto–who conducted a special truffle hound training seminar this year. But what a depressing truffle harvest it’s been. A cold snap in December really damaged this year’s wild crop just as it was starting to ripen. The above table was piled high with white, black and brown foraged truffle specimens last year. But Sunday it was bare. Oregon Wild Edibles! instead made the truffle butter they served with frozen fungus from last year’s season. Sad. People mushroom for their livelihood here. Given how sensitive truffles are to their environment, freezes and droughts, you wonder how climate change will affect future harvests. Though most chefs prefer the chocolaty, fruity Oregon blacks, it’s the smaller, more abundant white ones, redolent of garlic and ripe cheese, that I like best. You’re more likely to find black truffles in ice creams and other desserts; white truffles are almost exclusively savory. 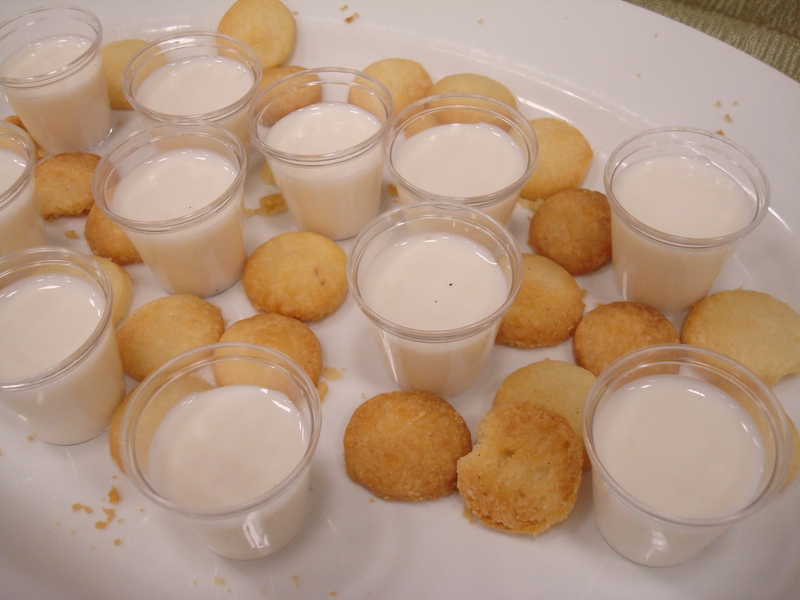 But they starred in a salty-sweet white truffle with Parmesan panna cotta and passion fruit cream the chef of the local Nib Dessert and Wine Bar demonstrated. Surreal. I also got a heady jolt of the whites in the housemade truffle oil the Joel Palmer House offered samples of. We’re hoping Joyce and Dan bring us along to this Fungal Feast again, since the Joel Palmer’s chef is planning the menu for the Lane Community College culinary students this year. 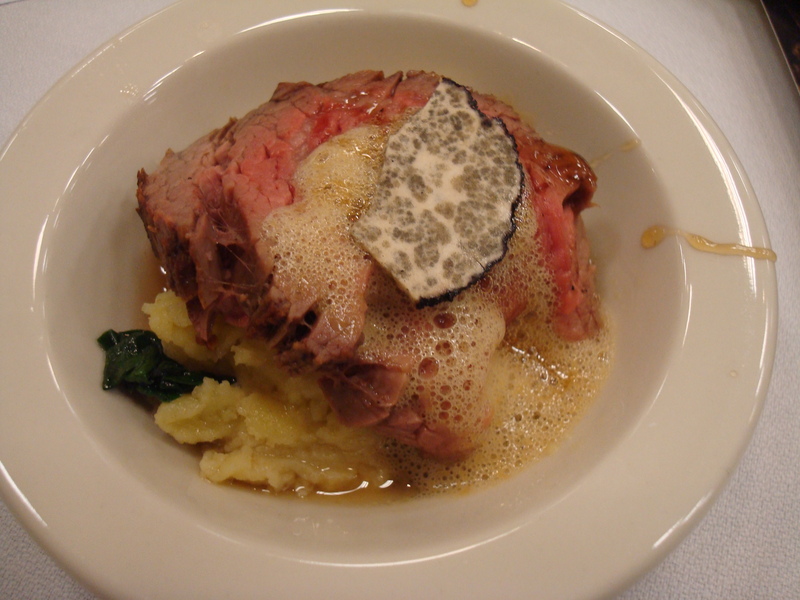 Black truffle-topped tenderloin on gnocchi in a foie gras (of all things!) broth. I’m certainly developing a culinary appreciation for truffles. Yet I’m almost just as interested in their delicate ecosystem, how they grow symbiotically at the roots of young Douglas firs, the foraging experience, etc. But of course I’m in it for the food. Boy though, they sure do make one’s flatulence smell. 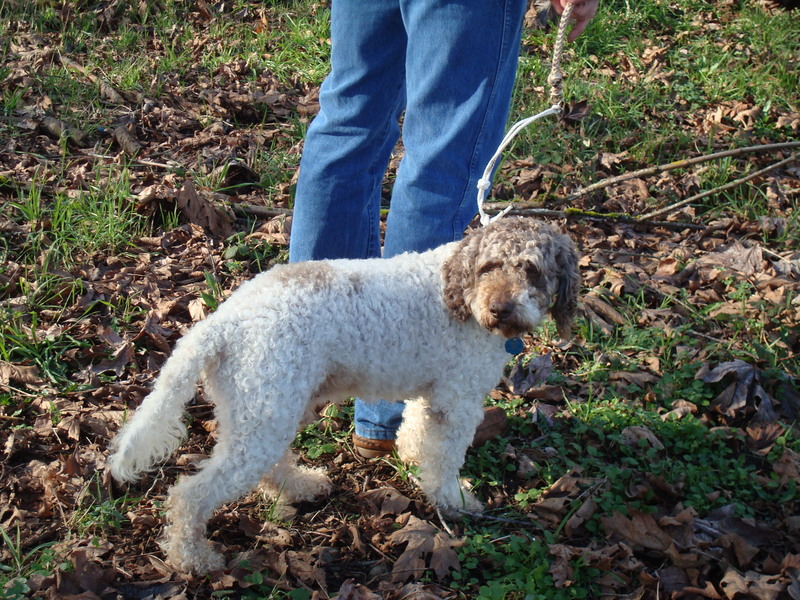 A Lagotto Romanoglo truffle dog visiting from the Blackberry Farm resort in Tennessee. A rare Oregon Brown found by the forager known as "Chicken of the Woods" was also starting to turn. Looks like such a neat festival but too bad about the problems with the harvest this year. I think I remember reading about attempts at truffle culture, growing them in greenhouses or such….but no substitute for nature probably. Can they at least use the not-so-pretty truffles to make truffle oil etc? Yeah, unfortunately these truffles seem to be rotting before they get fully ripe. And I think you really need the ripe ones to make oil. Most of the oil on the market is synthetic you know. Oregon black truffles are not the same sub-species as the winter truffles in France I don’t think. When we’ve bought the Oregon ones, they seem tame in comparison- mild and have to use much more to get the truffle smell and taste. I saw some online kits for culturing truffles- I thought under hazlenut trees in alkaline soil was recommended, but I may be mis-remembering. I’m still looking for a great truffle oil-my sister Ellen gave us a tiny bottle long ago when she lived in France, and 2 drops would fill the room with rich truffle aroma- but ever since, I have been disappointed with everything I have found. Now I have some serious truffle craving! heh, I see what you mean. 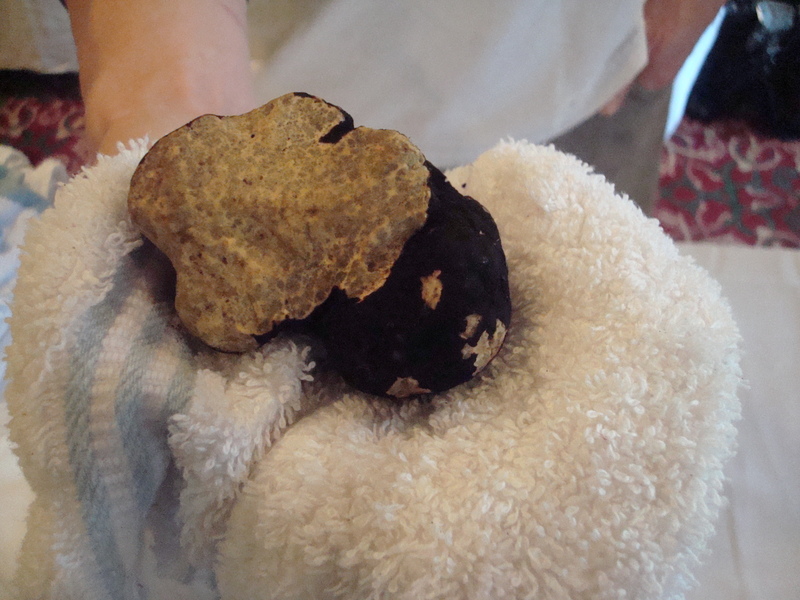 It is sort of truffle-colored, marbled like the inside of a ripe truffle.